In this day and age, many nonprofits have to get creative in order to find ways to raise funds. Here at Dreamscape Foundation, we try to find strategies that help us raise large funds efficiently so we can spend more time helping others. Enter eBay Giving Works: eBay’s way of letting online sellers and buyers raise funds for their favorite charities. In an effort to add a charitable twist to everyday shopping and bidding, eBay created eBay Giving Works. 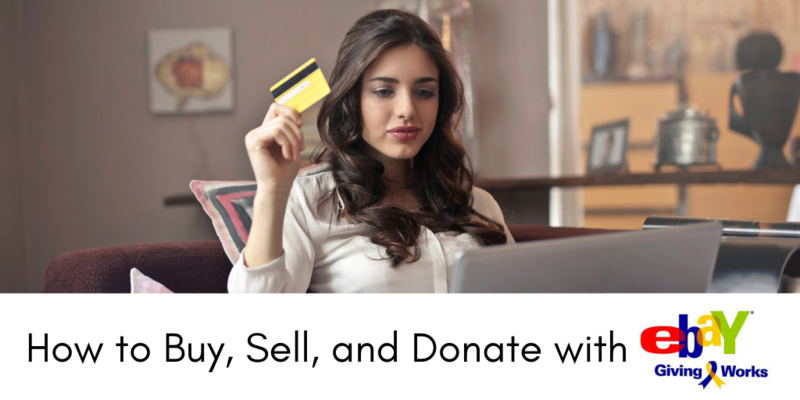 This charity platform is integrated into the website so buyers and sellers can make purchases while giving back to their favorite charities. The process starts with the seller. He or she chooses one of more than 24,000 charities available through the platform as well as the percentage of each sale that is donated to the nonprofit of their choice. That percentage is then automatically deducted when the product sells and given to the charity through PayPal. As a seller, you can select Dreamscape Foundation as your charity of choice and donate a portion of your item sales directly to our nonprofit. Once the sale is made and your donation is given, you will receive a tax deductible receipt that you can use when filing for that time period! You can also support Dreamscape Foundation by buying products on eBay that are supporting our nonprofit. These items are most common during the holiday season (November and December), and you can find them on our eBay Giving Page. There, you’ll find both our direct listings as well as those other sellers have active that support our cause. Want to Become an In-Kind Donor? Do you have something you would like to donate to help us raise funds to help individuals receive the accessibility tech and resources they need? Reach out to us about your business becoming an in-kind donor. All of the proceeds we raise through eBay Giving Works go directly toward helping individuals receive accessibility tools, programs, and other resources that help bridge the digital divide and make everyday life easier. Contact us today to start a conversation or explore our page on ways to get involved.